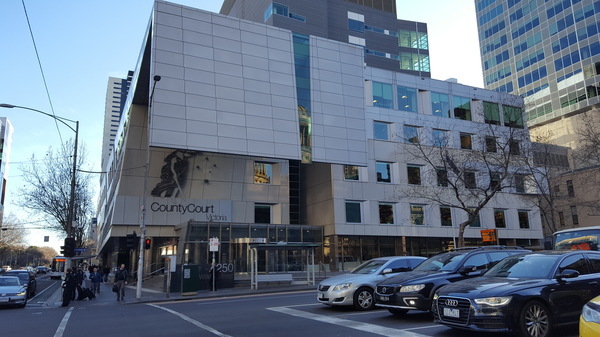 Three men have been jailed by the Victorian County Court over a series of terrifying armed break-ins at a family home in Keysborough. Anthony Claridge, 29, Damien Hobby, 27, and James Begg, 35, were in states of “ice-fuelled madness” as the male resident was thrice attacked in his home over a dispute in July and August 2017. During one of the break-ins, the victim’s three terrified children were present. They described being in fear of dying at the time at the hands of the “man with the gun”. On another, a sawn-off rifle was pointed at the victim and fired into a nearby wall. And on the last, he was repeatedly beaten with a pole, stomped, punched and kicked until he escaped to a neighbouring denture clinic. On two occasions, the offenders stole from the home after the victim fled. Judge Patricia Riddell, on sentencing on 20 March, described it as a “serious form” of “vigilante action”. About 7pm on 3 July, the male’s three children spotted an unknown male entering through the rear kitchen area while an armed Claridge and Hobby knocked and kicked at the front door. A front window was broken as the pair yelled for the victim to come outside. The court accepted that the intruders aborted the attack when they discovered the 13-year-old, 12-year-old and 10-year-old children. Judge Riddell noted however that the attacks resumed weeks later despite the risk that the children might be home. About 3.30am on 21 July, Claridge and an unidentified third man kicked in the home’s rear door, while Begg waited outside. One of them pointed a sawn-off rifle at the male resident in the kitchen. A shot was fired into a nearby wall as the victim retreated. He fled and took refuge in a neighbour’s front yard. The victim’s wallet containing $2500, four mobile phones and a debit card were stolen. Begg and Claridge used the card to withdraw $1000 from a Beaconsfield ATM later that morning. On the afternoon of 2 August, Hobby and an unknown male broke in and “viciously” bashed the resident in front of three other adults. The victim’s mobile phone was stolen by the attackers, while Begg waited outside. On their arrest, police seized a 12-gauge shotgun and .22-calibre ammunition from Claridge’s Holden sedan in Cranbourne. A home-made shotgun, cartridges and a phone were also seized from his home. From Begg’s Cranbourne home, police seized a .22-calibre sawn-off rifle, which matched the bullethole left in the victim’s wall. A home-made firearm, weapon cartridges, phones, ID cards and a foldable knife were seized from Hobby’s home. Claridge, Hobby and Begg pleaded guilty to a range of offences including aggravated burglaries, assault, causing injury, theft and obtaining property by deception. Judge Riddell said the offenders’ ice-effected states were an aggravating feature. Claridge and Hobby were also several weeks into their community corrections orders at the time of the break-ins. Since their arrest, all three had completed drug treatment programs while in remand custody. Their prospects for rehabilitation were positive, provided they remained drug-free. Claridge was jailed for up to 11 years, with an eight-year, two-month non-parole period. Hobby received an eight-and-a-half year jail term, with a minimum six years, 10 months. Begg was jailed for six-and-a-half years, with a four-year non-parole period.